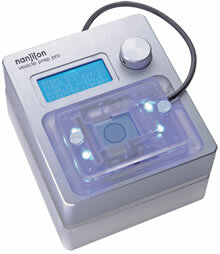 The Nanion Vesicle Prep Pro is a stand-alone workstation for the preparation of giant unilamellar vesicles (GUVs). To form the GUVs, the principle of electro-swelling is used. Lipid is spread on the glass substrate of the vesicle chamber, so that a thin layer of lipid is formed on the substrate. With the application of an alternating electrical field, the lipid layer releases from the electrode and the vesicles are formed. As transparent ITO Slides are used as electrodes the whole process can be observed with a microscope. The electrodes, as well as the liquid reservoir, are held in the Nanion GUV Chamber, while the electrical field is generated by the Vesicle Prep Pro© station. This enables ease of use and a comfortable control of the size of the GUVs. Part of the development of this instrumentation was done within the EU-Project 019335 ‘Translocation’. 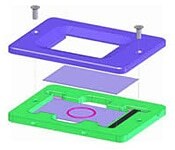 Nanion’s planar patch clamp chips for the Port-a-Patch not only allow for recordings of cell membranes but also of artificial bilayers. The planar lipid bilayers can be prepared on the chip either by the painting method or by GUV (giant unilammellar vesicle)/liposome fusion on the aperture. The chips are mounted in a holding device, which is very effectively shielded. Due to the miniaturized and integrated design, no vibration isolation is necessary. Comparison of noise levels routinely achieved with either painted bilayers (top, 50 μM aperture chip) or bilayers prepared form GUVs (low, 2 μM aperture chip). In both experiments Gramicidin A was recorded. The noise performance is in favor of the GUV method, as smaller bilayers with lower capacitance (and hence lower noise) are obtained. Lipid: Diphtanoyl-PC. Recordings: Tohoku University, Tohoku, Japan. The GUV chamber consists of two parts which are joined together by two screws (below). Application of alternating electrical fields to the lipid-covered ITO-slides leads to the formation of vesicles (below). Typical diameters of the vesicles are in the tens of microns (scale bar: 25 μm). GUV preparation by Markus Sondermann, Group of Prof. Behrends, University Freiburg (below). Amplitude (peak to peak): 20 V max. Capacity for liquid: 200 μl (typ. ), 900 μl (max.